Canada’s second largest independent oil producer, Cenovus Energy Inc., announced on Thursday that its capital expenditure for 2015 will be cut by 15% due to low oil prices. Capital spending for 2015 will be reduced to between C$2.5 billion and C$2.7 billion, compared to 2014’s estimated total of C$3.0 billion to C$3.1 billion. The company said its 2015 capital budget concentrates on continued profitable investments in oil sands projects. 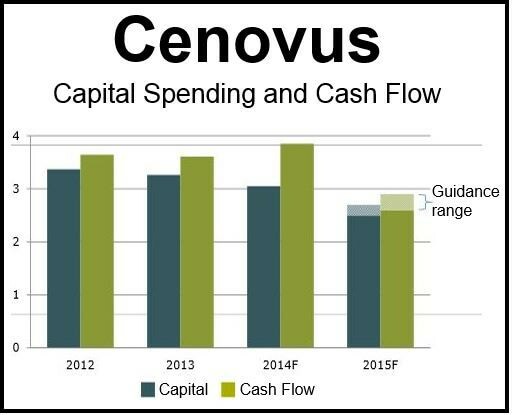 Cenovus expects total cash flow for the year to be between C$2.6 billion and C$2.9 billion, based on an oil price of between US$74 and US$81 per barrel (West Texas Intermediate, WTI). On Thursday, WTI hit a five-year-low price of US$61. The company forecasts production in 2015 will grow by about 9% for oil sands and approximately 4% for total oil production. Since peaking in June 2014, oil prices have plummeted by over 40%, due to the slowing economies of China and the European Union and spectacular growth in shale oil production in North America. Nearly all oil companies globally are tightening their belts and warning of expenditure cuts and restructuring for 2015. BP said it would be spending about $1 billion on restructuring, which includes reducing its workforce. Most of Cenovus’ budget will be spent on the Christina Lake and Foster Creek oil sands projects in northern Alberta. ConocoPhillips has invested in both projects, which Cenovus operates. Cenovus said it will be spending much less on Alberta’s Narrows Lake oil sands project, which it operates jointly with ConocoPhillips. The company predicts total oil production in 2015 will be between 197,000 and 214,000 barrels per day. The average this year is estimated to be 198,000 barrels per day. While making no mention of job cuts, the company announced that it does not expect to expand its workforce next year.